I joined the RAF with Paul Hopkins at the RAF College Cranwell in 1969. He was the outstanding pilot on our Entry and went on to become one of the first 1st tourist pilots to be trained onto the Harrier. His first tour was with No 1(F) Squadron (1973-75), before moving to No 3(F) Squadron and then No 233 OCU as a QWI. Paul was selected for test pilot training on exchange with the US Navy before returning to UK for 3 years with A Squadron at RAF Boscombe Down. Leaving the RAF in 1985, Paul had an outstanding career with BAE Systems where he was involved in test flying on the Harrier GR5, Hawk 100/200, Tornado GR1 & ADV, Gripen & Typhoon. He became Chief Test Pilot in 1997. In 2004 he was awarded the GAPAN Derry & Richards Memorial Medal for his contribution to test flying and finished flying in 2005, moving into project work until his retirement in 2012. Sadly, shortly before retirement, Paul was diagnosed with motor neurone disease. Paul was undoubtedly one of the pre-eminent fast jet pilots of our generation and he has contributed a huge amount to the safe and effective development of our military fast jet fleet over the last 30 years. 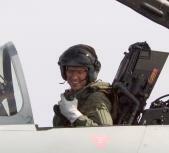 Now would be a great time to show your appreciation for one of No 1(F) Squadron’s finest pilots of recent times.